I wanted to write this post for about two weeks, but I just did not know how to start this blog entry or what to title it. So, after contemplating what to write for a few days, I figured I would just jump right in with my thoughts and let the words flow. 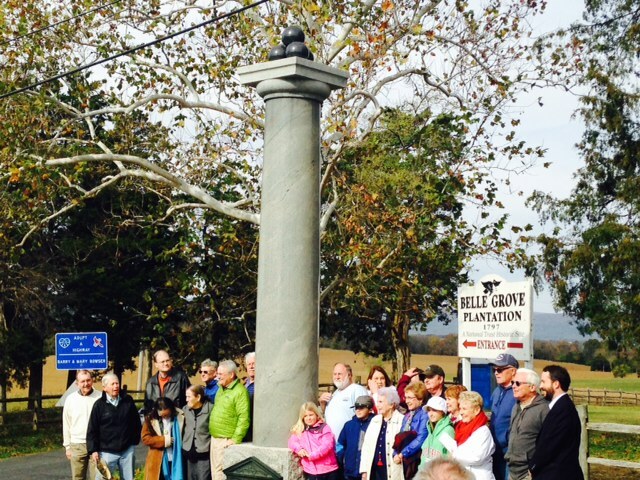 Living Ramseur Family members re-dedicating the monument to Major General Stephen Dodson Ramseur, approximately 150 years to the exact minute, their ancestor died. When I am not blogging for the Emerging Civil War, I am a professional historian and park ranger for the National Park Service. When big events, commemorations, anniversaries, etc. are scheduled by national parks, that particular site can ask for rangers to be detailed in to help. 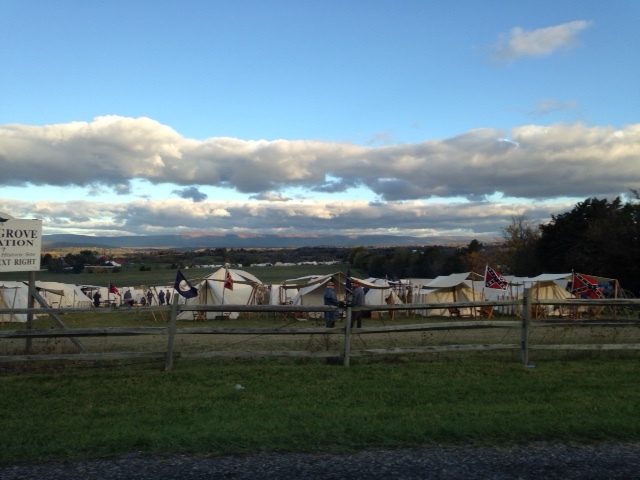 I was lucky, privileged really, to assist with the 150th anniversary of the Battle of Cedar Creek and joined for a few days the great historians at Cedar Creek and Belle Grove National Historical Park. That is when the “geeking out” in my job began. Hundreds, thousands more like it, came to the park, the park partners, to catch the reenactments, the battlefield tours, car caravans programs, and the real-time talks. Some of the ground that was walked on, including a program that I had the privilege to lead, was on recently preserved land and being accessed for one of the very first times. To be on the same ground 150 years after the action took place, with ancestors of some of the soldiers that fought, bled, and died on this sacred ground, was humbling. 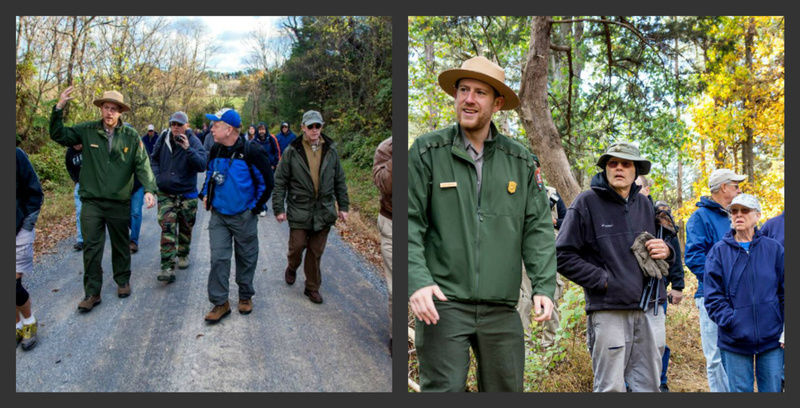 Leading a walking program following the route of Confederate General Joseph Kershaw’s attack on October 19, 1864. Hearing the different accounts that my fellow historians shared with the public and fellow history enthusiasts like myself, made me realize one fact. My job, like any job, has its down…but then it has its “awesome, amazing, humbling, and inspiring” moments. Add in the emotion, the connections of being on sacred, consecrated land. Heroes walked here, heroes bled here, heroes who fought for a cause; whether we agree with that cause or not, gave the ultimate measure here. And my job was to share those stories, solidify the connections between visitors and the combatants. That is pretty cool! That is the reason I joined the public history field and that is one of the reasons I write for Emerging Civil War–to inspire, share, and learn from other great public historians; both fellow bloggers and readers. And the simple saying, “just another day in the office” sometimes just does not really cover it. This entry was posted in Armies, Battlefields & Historic Places, Campaigns, Civil War Events, Common Soldier, Leadership--Confederate, Leadership--Federal, Memory, National Park Service, Photography, Sesquicentennial and tagged 150th Cedar Creek, Cedar Creek and Belle Grove National Historical Park, Cedar Creek Battlefield Foundation, Joseph Kershaw, Middletown, National Park Service, Shenandoah Battlefield National Historic District, Shenandoah Valley Battlefield Foundation, Shenandoah Valley Campaign of 1864, Virginia. Bookmark the permalink. Huzzah! This is why I teach Middle School, why I write, why I talk so darned much about the past–ECW has a good future ahead of it! And a lot to do. How wonderful to see the Ramseur descendants! When I toured Belle Grove estate last year the docent described how General Custer came to Ramseur’s death bed there. To stand in that room, and imagine old friends, now enemies, bidding farewell was very moving. It seems that affection can transcend warfare, if only for a moment. Thank you for this post. Had great time at the 150th of Cedar Creek. Three generations of Robert Terrell(3rd Indiana Cavalry) descendants. Enjoyed reading Bloody Autumn.